Costa Rica is a third world country trying to be as cosmopolitian as posible. It is a country of extremes and from someone used to the affluence of the US there is very much poverty. The poverty seems to have created a society with gates and security fences almost everywhere. All but the poorest have security grates on every door and window. This means that you see ironwork everywhere. However, very little is very artistic and almost none is forged. 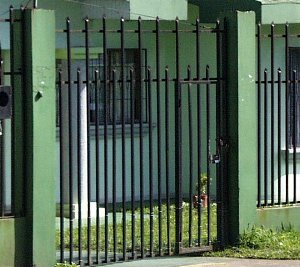 The most common fencing is made from thin wall square tubing with the top ends crimped and sheared to a point In the capital, San José the fence to the right would most likely be topped with razor wire. Left, less common but plentiful is welded work with a little added design. This country gate has the typical scroll elements added on as decoration. 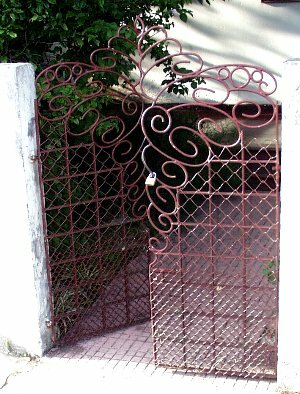 This gate is unusual in that it has a very nice artistic design and the scrolls are more than just jig bent. 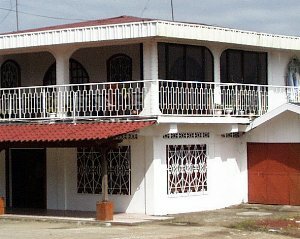 The property is on the city square next to the church. Although this is a very nice design there is no forge work. In fact the scrolls are cold bent in 3/8" round bar. However, it is well executed and the welds very clean. 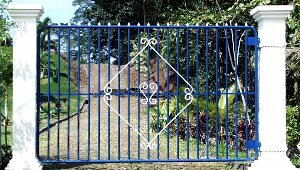 A very small percentage of Costa Rican ironwork is of this class.